Read the press statement by the All Progressives Congress (APC), Benue state. 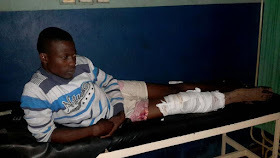 Yesterday evening an All Progressives Congress, APC, social media activist in Benue State, Mr. Armstrong Iorwase Msugh Chir, was attacked and his right leg broken. His attackers accosted him with the vow that they would teach him a lesson for writing against their leader, former Governor Gabriel Suswam, on Facebook continuously. Luckily, neighbors who heard his cry for help responded and came to his rescue. One of the Good Samaritans identified one of the three assailants as a PDP youth leader as he fled the scene. We have already reported the matter to the Police E Division in Makurdi. On July 15th this year a similar group of people attacked me and said that they were going to attack all of us that had defected to the governing party one after another. They broke into my room and collected all my handsets and other valuables. Yesterday's attack has confirmed that those PDP thugs weren't joking. On the contrary, it is a fact that none of the PDP social media activists who constantly malign and ridicule the name of our God fearing Governor Ortom on a daily basis, has ever being attacked. The opposition has also resorted to intimidating our team by using the police to arrest and detain our members. With these developments I wish to declare that the PDP has murdered sleep in the state. While we urge our members to remain resolute in defending the hard won mandate of the people we shall deploy all legal means to bring the attackers to book. We however make it clear that except the law enforcement agencies move in swiftly we shall be compelled to resort to self help in protecting our own and in getting Justice. State Ag. Publicity Secretary, APC, Benue State.